I feel like I did not accomplish my goal of doing something active every day this past week, but in my defense it is was a ridiculously hot week. Like 40 degrees in the shade hot. So I most definitely did not bike to work! Also the AC at work was broken until Thursday so it a sweatfest regardless. Thank the lord for AC repairmen! But onwards and upwards to a recap of my week! Monday- Holiday here in Toronto and I got in almost 10,000 steps according to my fitbit app on my phone (which means it only records my steps when my phone is on me, and therefore excludes my many walks to the fridge ;) ). I didn't do much beyond walk to Queens Park to lie in the grass and read with my friend. Tuesday- Did another 10,000 steps I went out for dinner with my friend in Koreatown (mmm bibimbap) and also traipsed all over the west end buying birthday presents for my niece. Wednesday- 5.7km run. Went in the late evening to cut the heat! Thursday- 8km run. Also went later in the evening (but not late enough) and pushed the pace. It was a good, but tiring, run. I crashed at 8pm. Saturday- 5km run at 8am. 8am was not early enough. Very hot!! Spent the afternoon/evening celebrating the first birthday of this little cutie. Where does the time go? Sunday- 9km run at 8am. 8am was not early enough (and I really should have known this). It was supposed to be 11.6km, but between the heat and my hip flexors, which have been sore lately, it was just not happening and and I came home and went back to bed. All in all in was a good week, and I'm surprised how many steps I got in! Over 10,000 each day! No wonder my hip flexors are feeling it! I also mentioned last week that I signed up for another half marathon!! 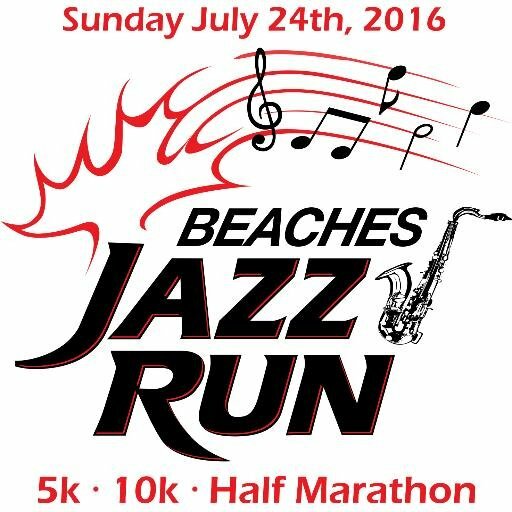 I am running the Beaches Jazz Run on July 24th! I have no intention of PRing at a half marathon in JULY right now, but I figured it would keep me running all summer (I have a lazy bone in me that cannot be removed), and it was reasonably priced, AND it looks like it is the first year this race will be time-chipped, have medals, have FREE photos, and it's being run by a local club so it feels like it will be a good, fun race. Kind of an inaugural race. Since the Midsummer's Night Run is seemingly gone for good, it is nice to find a new mid-summer run! Anyway, I am trying to work on speed this summer, so I am hoping that maybe I can finish around my PR of 1:55 (however, that was on a nice cool day. July won't be as favourable weather-wise). But I also super enjoyed the pace of the first half of my marathon (I ran the first half in 2:06) and I am hoping to just enjoy my race like that again. so maybe somewhere in between? 2:00? We will see how training goes! Love the colour of your nails! 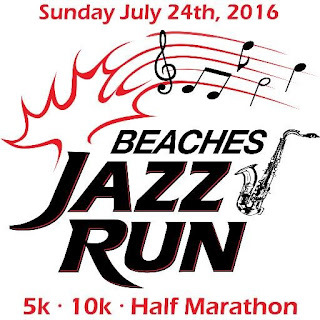 I also had no idea the Beaches Jazz Run included a half. Sounds like a really great race! Totally Rad 80s Prom Gone Bad!! Sporting Life 10K 2016 Race Recap! Further Thoughts on the Marathon and Recovery! Goodlife Toronto Marathon 2016 Race Recap! !